A frustrated writer and poster enthusiast got upset when she had a hard time getting a Patti Smith print delivered to her home in Brooklyn. What did she do? 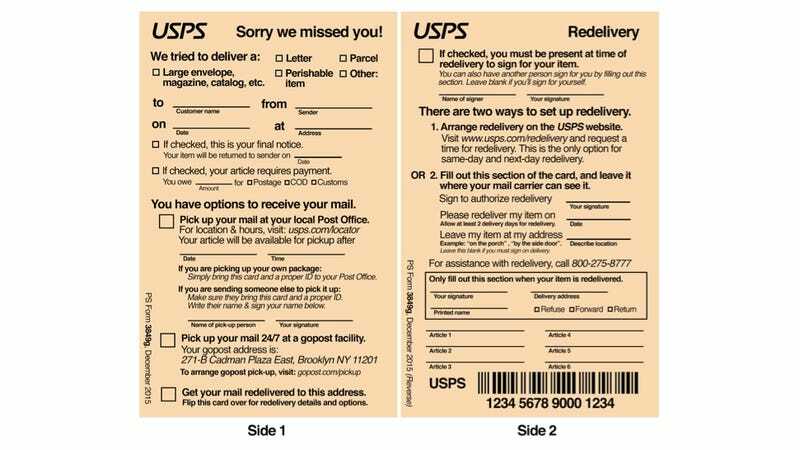 She redesigned the slip that the United States Postal Service (USPS) uses to notify you that they’ve fail to deliver. Which makes me think: Why does the postal service still use these stupid slips to begin with? But I’ll get back to that in a second. The messy layout wastes space. There’s repetitive information. It’s honestly hard to figure out what information goes where—and that’s if you have good eye sight! Aufrichtig’s improvements are subtle, perhaps subtle enough to convince a massive bureaucracy to adopt them. Her primary design decision was to flip the card and make it a vertical layout. From there, she created simple sections for what the postal worker was attempting to delivery and when. Then come three easy options for what to do next, including post office pickup, re-delivery, or the new 24-hour locker-like service called Gopost. Finally, there’s a section for instructions on redelivery. As the designer herself states, the re-design is actually more text-heavy than its ugly predecessor. So that brings me back to my bigger question about why the postal service is still using little slips of paper like it’s 1995 or something. Even the private giants FedEx and UPS have their own ugly paper slips, though they’re nice enough to add adhesive to the back so the cards don’t blow away into a gutter. Wouldn’t it be easier to keep track of all that text and handwriting if all this were handled digitally? Sure it would, but not everybody has a smartphone glued to their hand for half the day. The paper system exists because there’s not a perfect alternative quite yet. The USPS is actually rolling out new technology that will allow you to look at scans of your snail mail on the web. You could imagine how this sort of functionality could evolve into a notification system that would let you send redelivery information directly to your letter carrier’s handheld device. It’s unclear if the USPS actually plans to do this, however. In the meantime, Aufrichtig’s redesign looks like a solid step in the right direction. She even designed it so that it would fit on the same size card and use the same bureaucratic accounting systems—e.g. barcodes and article numbers—as the current cards do. While the postmaster general considers (or ignores) her suggestions, you might consider getting an app called Parcel for tracking your deliveries. It’s not a perfect solution. But it’s better than what we’ve got.